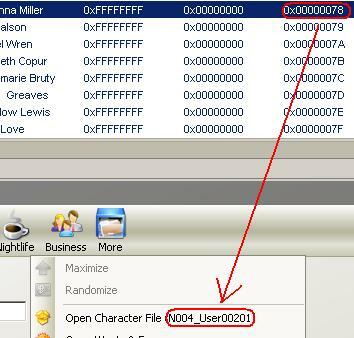 First, start your game, open up a family, select your lot debugger, SHIFT-CLICK and pick out the sim(s) you wish to kill. Debug mode must be on! Note down the circled number. Repeat for all sims you prepped for delete earlier. Close and return to Ye Olde SimPE, or try to do this in Newfangled Craptastic, if you can figure that out. I have no idea where that went. Now kill their files, as circled in blue. DO NOT KILL THE SimDNA (SDNA), as marked in red! Re: Deleted 2: Electric Boogaloo! 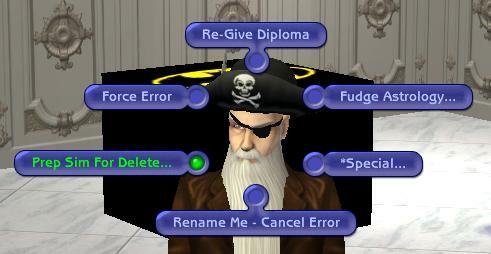 Under what circumstances would you need to delete individual sims like this? Anytime you want to get rid of sims, such as ugly townies, extra NPCs the game forces on you, or whatever, you must completely purge them from the game so you don't have loose ends and random junk throwing up errors all over the place, ultimately leading to a BFBVFS. You'd want to delete, say, unwanted townies, extra NPCs, stuff foisted on you by expansion packs, dummy sims that SimPE's crappy Simsurgery foists on you if you were dumb enough to follow the public tutorials, etc. resetting the sim creation index is a new one on me what is that all about? I've been igorning those unknowns. Does it regenerate if you just delete it - like after using deleteallcharacters on a clean hood? Don't delete that. Resetting the index is what causes the game to recycle the old NIDs. Without recycling the NIDs, the game will continue to spiral towards its inevitable doom anyway, even if the files are deleted. Resetting the index causes it to reuse the nearest vacant NID instead of continuing to obliviously count towards certain 16bit-doom. OK got it. - so I should reset the counter in all the hoods where I have deleted sims at some point in the past including my default shopping subhood Sedona? Subhoods do not use creation index. And yes, resetting the pointer can be done at any time, which will cause the holes to be reclaimed by new sims. The subhood starts life as a hood, so I'd feel happier fixing the orignial hood and creatiing a new template from it. I guess the hood loses its counter sometime during the install process though. I'll compare the OFB template and mine again looking at it. Please do tell me if anything in that subhood is unsafe! As it's the first one, I want it right or I'll be to blame for messes in other peoples games both from my hood and from anyone who makes a template using mine as a model! Never used it. Wouldn't know. I do know that subhoods don't use the counter at all, though. Is your subhood an unpopulated template, or did you stock your own Cwykeslanders? It's got home-made alien tourists aka townies to sell your expensive junk to and a few alien immigrants stuck in the middle of the desert. I did deletallcharacters first and cleaned up the remains of them in SimPE. I got rid of grimmy etc after as well. Jordi said it looked OK. It's the bits I didn't know to do that scare me. Edit - OK I've got simPE open on my test hood. You have to open the hex editor to get to change bit of code - That's not on my standard screen and hex got cut off the LHS of your screenshot, so it took a few moments headscratching - you might want to add that instruction for dummies. I changed the values to 0x01 and 0x0001 and saved. You've got two square boxes highlighted on your screen. I guess the squares mean blank boxes and there shouldn't be anything there. I've got a symbol in the 0c place not a blank. Does that matter? 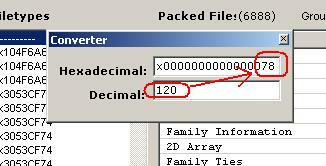 The 0c is the offset. It's not really part of the file, and it's circled to tell you where to edit. So yes, that's correct. OK done - fyi the Bluewater default has c3 and 0 set in these fields. The install must just drop this field as useless I guess. I've let Quaxi know about this 'Sim Creation Index'. Nice discovery. It just needs to be edited in tgi.xml for it to be labelled. It'd be nice if he could get delete a sim working in SimPE and bring that back again. In communist China Peggy's hairs cut you! Yes, you may notice I try to avoid that thing like the plague, to the point where I'll flip between Ye Olde SimPE and back just to avoid using that accursed thing. When *I* do this, I won't even try to use the newfangled SimPE Editor. *I* do it by extracting the file and using Ye Olde DOSse Hexe Editore, but I figured I wouldn't make you chumps download a new program just for that. That is how much I hate New SimPE. DOOM TO THIS ACCURSED THING! Could you fix SimPE, Pescado? Not without spending way too much time studying it and trying to revert it back to Ye Oldeness. It's not, and Quaxi pretty much ignores our feedback. "Do not use on any sims with relatives [...]"
That means the lot debugger won't change the family ties? But we can sever those ties after deleting the sim, can't we? Sims with family ties are messy at present and not supported. Deleting someone's father is bad, since it will confuse the game. Is any of this necessary if your method of getting rid of unwanted sims is to drop satellites on their heads? I had a number of copies of sims that I wanted to get rid of so I could use their houses and so I put them in the game and killed them off first thing. Most of these sims did not have any relatives and certainly did not have any relatives in that particular neighborhood. But then I started running into problems in that neighborhood. With a census of only 430 (and only 65 of them playable characters and 60 of them dead) I cannot try for a baby anywhere with anyone. Even the pregnant dog has not given birth and she has been due for a sim week. I have been leaving this neighborhood alone since I noticed the problem. I decided to just wait until the next SimPE comes out to see if there is anything I can see to fix from there. Family aside, moving an occupied house into the lot bin is fairly well-known as a VBT. There are ways around this (read: severing every connection the incoming sim has to everyone else in SimPE; package a lot to a file and then reinstall it with clean pack installer to see just how many sim files have to come along), or else you can just find ways to make sure the furniture doesn't leave as the outgoing sim does. If your method of getting rid of sims involves killing them but no mucking about in files outside of the game, you should be in a better position. Dead sims are generally processed in much the same way as the living, even shredded files after gravestone deletion are designed to be parsed by the game. It's just that the game is prone to confusion and population bloat as the number of sim files grows. Pes' solution is for when you have a lot of sim files floating around the neighborhood unproductively and you want to cull some of the unnecessary files floating around.